It is 1926, and the museum’s exotic curios and occult artifacts open barriers between our world and the elder evils lurking between dimensions. Other Worlds begin to leak through and terrifying creatures of increasing strength steal through them. Animals, the mad, and those of susceptible minds are driven to desperation by the supernatural forces that the portals unleash. In the midst of this chaos, a handful of investigators race against time to locate the eldritch symbols necessary to seal the portals forever and stop evil Ancient Ones from reducing humanity to cinders. Inspired by the horror stories of H.P. Lovecraft, Elder Sign pits players against the terror posed by one of eight possible Ancient Ones. Each of these otherworldly horrors insinuates its unique presence into the world, hindering or limiting your investigators' ability to seek the Elder Signs. If evil persists, the Doom track advances, bringing the Ancient One closer to awakening. The Clock progresses inexorably forward, reducing the time available until the great otherworldly horror emerges. Each time midnight strikes, there is a chance the Ancient One’s power will spill more fully into this world. Monsters may appear, and the Doom track may advance. 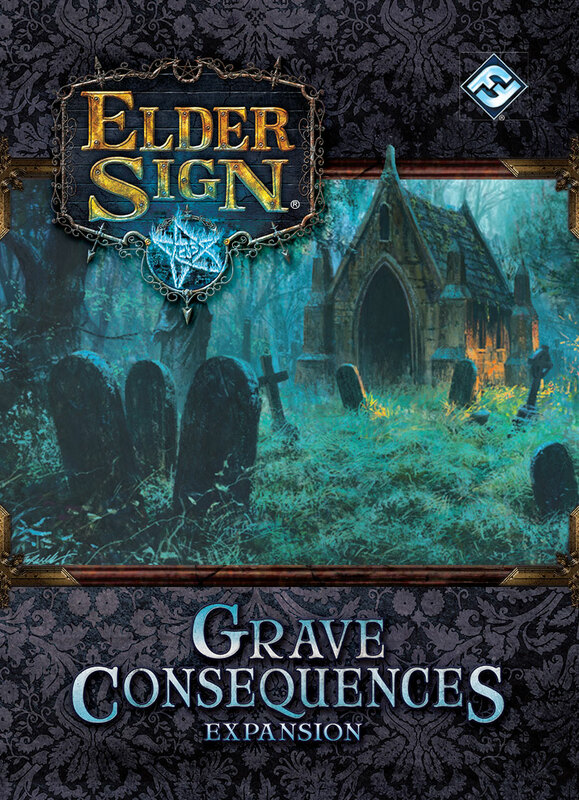 Investigators must find enough Elder Signs to seal away the Ancient One forever before it awakens, or they will find themselves forced into combat, directly confronted by the being’s awesome power. At the beginning of each game, and each time the Clock strikes midnight, a player must draw a new Mythos card. These cards mirror the increasing influence the Ancient One has in the world. As the investigators continue their desperate exploration, Mythos cards release monsters into the museum and surrounding area, advance the Doom track toward completion, strike at the investigators’ resources, or add new dimensions to the Adventures awaiting the investigators and players alike. Because the Mythos deck spreads the Ancient One’s influence round by round, players must move quickly. Their investigators must undertake harrowing adventures, confronting supernatural monsters as well as sheer terror and madness. All the while, they must keep their wits about them, looking for whatever clues they may find among the aisles of artifacts and esoterica. The investigators cannot afford to fail, lest the Ancient One awake. To locate Elder Signs, investigators must successfully complete Adventures within the museum and its environs. To resolve an Adventure, you must match dice results against the requirements for each of the Adventure card’s tasks. If you fail to complete all of an Adventure’s tasks, your investigator suffers the consequences. Often this means a loss of sanity or stamina—or both. Investigators who have their sanity or stamina reduced to zero are devoured and removed from play. Other failed Adventures push the Doom track further forward or release monsters into the world, making the investigators’ task all the more difficult. When you successfully complete all of an Adventure’s tasks, you unlock its rewards. They can yield clues, provide new resources, introduce investigators to new allies, or uncover vital Elder Signs. Not all rewards are good, though, and the successful completion of some Adventures may release monsters or lead to Other World Adventures, bringing greater risks and rewards to the table. Elder Sign features 48 Adventure cards representing the supernatural events and places of intrigue in and around the museum the investigators must explore to stop the Ancient One. During game setup, players build the museum with six initial Adventure cards, chosen at random. The staggering number of possible museums means that investigators will almost never pursue the same sets of clues in two separate games. Additionally, all Adventure cards feature unique requirements, and many have powerful text that radically alter gameplay. Given such eldritch perils, what drives the men and women called to explore the museum? Each of the sixteen available investigators have individual talents and resources they bring to the search for the Elder Signs. Many investigators dedicate themselves to a specific research focus, allowing players to alter dice rolls or substitute one die result for another. Some focus on acquiring more resources. Others can restore sanity or stamina to investigators who have suffered the loss of either. We were not, as I have said, in any sense childishly superstitious, but scientific study and reflection had taught us that the known universe of three dimensions embraces the merest fraction of the whole cosmos of substance and energy. In this case an overwhelming preponderance of evidence from numerous authentic sources pointed to the tenacious existence of certain forces of great power and, so far as the human point of view is concerned, exceptional malignancy. Players may select the investigators of their choice or choose them at random. No matter which investigator you control, you must use your investigator’s talents and resources strategically. Investigators have access to common items, unique items, and spells which may afford extra dice during Adventure resolution or allow a player to substitute one die result for another. Most investigators begin with two starting items and can acquire more through the successful resolution of Adventures. Clever use of investigators’ talents and timely item use are crucial as players work to bend the luck of the dice to their favor. In addition to the investigators’ talents, spells, items, and allies which allow players to adjust dice rolls, the rules permit players to “focus” dice, saving one die result for a future roll at the cost of an extra die. Players can only focus a die once per Adventure card, so judicious use of the focus rule is essential to the completion of the more complicated Adventures, especially when monsters appear! Players may cooperate to assist each other’s rolls, but any investigator assigned to assist another risks losing sanity or stamina even when it’s not his turn. Elder Sign recreates the Lovecraftian thrills of eerie suspense and mind-numbing horrors in a game players can finish in one to two hours. Expert design in rules, card text, and innovative dice mechanics blend to form a game that’s quick to learn, quick to play, strategic enough to reward frequent replay, and eccentric enough to immerse players in the museum’s supernatural intrigue. Lavish artwork, sanity-draining Adventures, and gates to other worlds—avid readers of H.P. Lovecraft should find themselves at home in their hunt for Elder Signs as the end draws nigh. The copyrightable portions of Elder Sign are © 2011-2013 Fantasy Flight Publishing, Inc. Elder Sign, Arkham Horror and Fantasy Flight Supply are trademarks and/or registered trademarks of Fantasy Flight Publishing, Inc.